A country visit fulfills many purposes. More horizontal communication (in many parts of the world access to digital media is limited), the ability to give direct quality feedback, and giving producers a chance to share local food and culture are just a few. Earlier this month, the Social Business Network made a special trip with ETICO and a coffee roaster from the states to visit a small group of coffee growers in El Salvador. The cooperative that drew us there is called La Concordia, and is made up of only 19 families who cooperatively farm 70 acres of shade grown organic coffee – land that was given to them during the agricultural reformation in the early 1980’s. The struggles that small groups of organized farmers face are numerous. Over the years, this particular group has worked with several initiatives to try to export their coffee, but changes in the membership of organizations, the cooperative and export laws of El Salvador, and low yields have come in the way. The farmers struggle to cover their costs of production and organic certification by selling as much as possible to other cooperatives and growers who export, and the rest on the local market. Although these challenges may have seemed insurmountable, especially after so many years of false hope and failed attempts, the solution may simply lie in bringing as many links of the chain together, face to face, with a common positive intention. 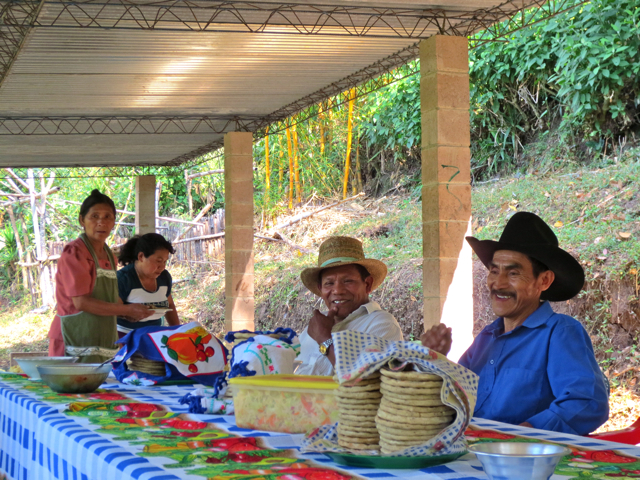 With some preparation, members of the La Concordia cooperative sat down at a table with a nearby cooperative that processes and exports, an importer, a roaster from the US, and the Social Business Network. After touring the farm, sharing the histories of our organizations and eating a home cooked meal together, it only took a few hours to piece together a plan where each member of the chain pitches in to make the logistics for export to work – an understanding that may have been impossible to reach over email or from a long distance. Coffee farmers look for export markets because of market security (ideally forging long-term relationships with individual purchasers), higher prices and substantial sales volumes. If the cooperative can meet the volume and quality demands of the export market, this may be an opportunity for a company in the US to have a huge impact on the lives of this small group of farmers. For businesses looking to maximize their social and environmental impact through the purchase of raw materials however, working with such small, inexperienced groups have additional costs and risks. Business mechanisms like stipulating funds for social and environmental projects within the cost of the product can efficiently establish transparency, ensure corporate responsibility and help maximize impact. But a whole additional level of value in trust and understanding can be reached through a well organized trip to the field with the right players, and finding the right people on the ground who can facilitate good, culturally appropriate communication. Read a reflection of the trip by Rachel Lindsay (Social Business Network’s Communications and Sustainability Director) on her blog. This entry was posted in Cooperatives, El Salvador, Fair Trade, Social Business Network, Supply Chains on 17/01/2013 by rwlindsay.